OneDrive have been developed to be more and more mature and really a best place for storing files photos and videos together with a capacity of 15GB storage, as well as specifies a brief way to quick access what you have stored via OneDrive app for iOS, Android, Windows Phone and Xbox. Cannot play video on OneDrive? After reading this guide, you can easily uploading MKV,AVI,WMV,MPEG,M2TS etc video files to OneDrive with suitable formats for enjoying with no interruptions. How to Fix ‘Cannot Play Video on OneDrive’ Error? To superior way to solve OneDrive video playback error is to convert incompatible videos, for example 1080P HD MKV, M2TS/MTS, HEVC, AVI, WMV, FLV, to MP4 and then upload to OneDrive for an undisturbed playback on PC/Mac and various devices.here recommend you UFUSoft Video Converter Ultimate (For mac users: Video Converter Ultimate for Mac) to finish this task. With it, you can batch convert any videos (like MXF, MTS, MOV, MP4, XAVC, etc) to OneDrive playable format in extremely high quality at super fast speed with the CUDA/AMD technology support. Step 4: Click the “Convert” icon to start the video to OneDrive conversion. Click the “Convert” icon, and the conversion will be started quickly. Once finished, you can get the output videos for your OneDrive via clicking on “Open” button effortlessly. 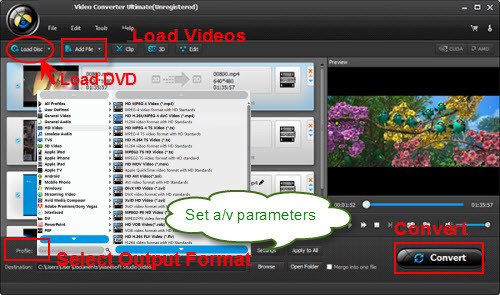 « How to Make Sony PS4 Playback MKV Video Files with MKV to PS4 Converter?